AFR was overjoyed to once again be a part of The Special Event, the largest annual gathering in the wide world of event professionals. 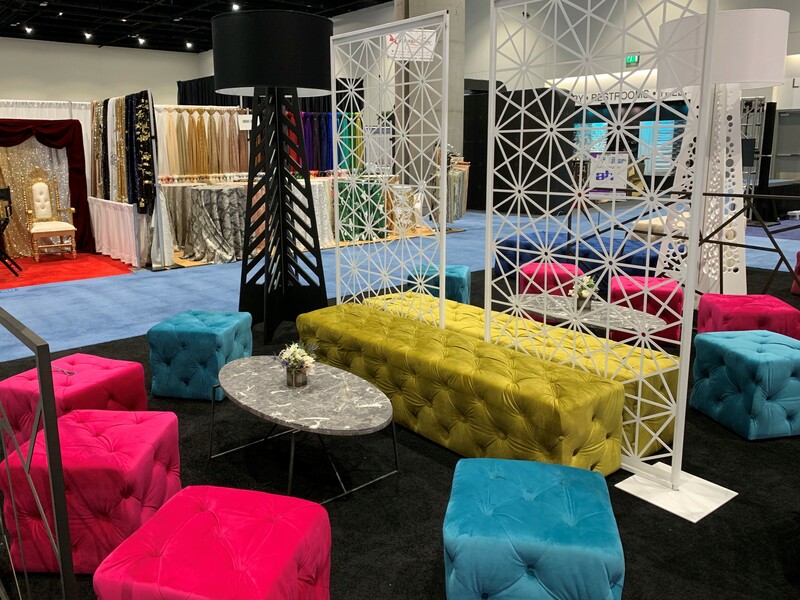 This year the conference took place in sunny San Diego, California at the San Diego Convention Center where more than 4,000 of the industry’s best and brightest joined to educate, learn, share, and collaborate with one another. 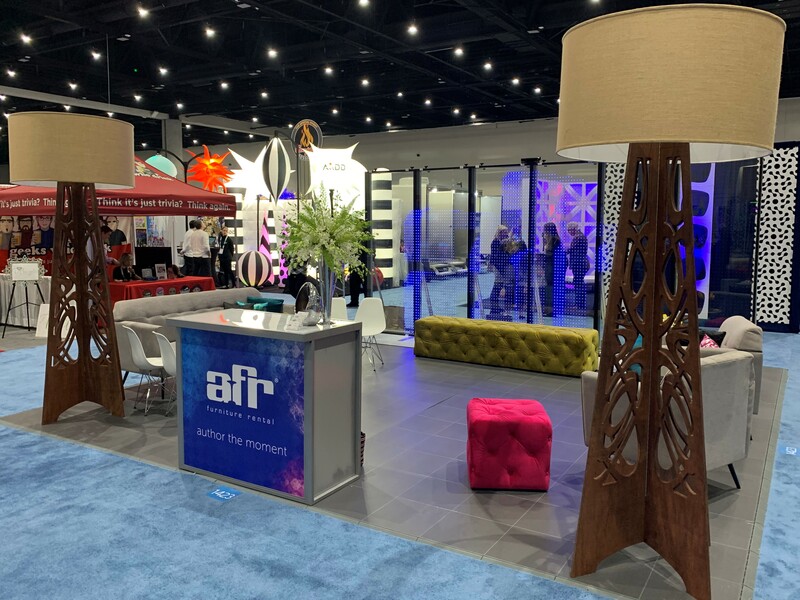 AFR took advantage of this perfect opportunity to exhibit their many new and exciting product additions and much more. 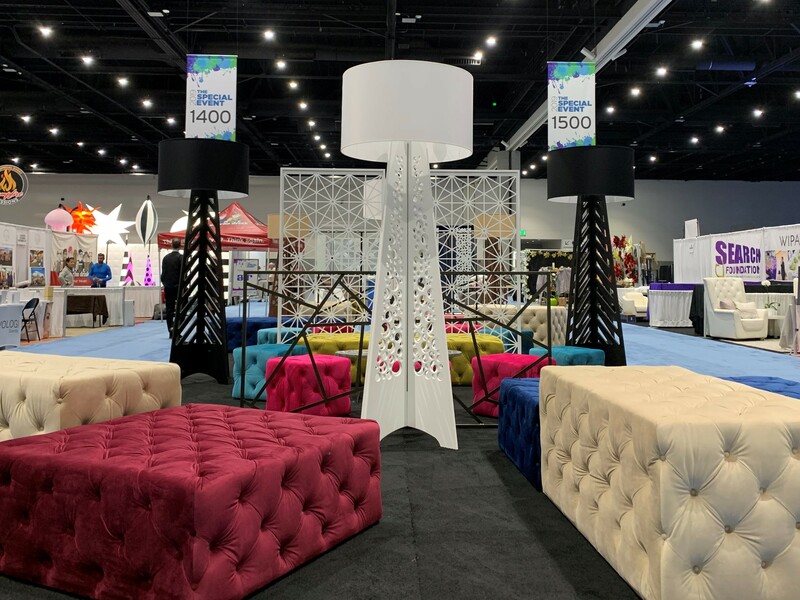 A leading provider of event furnishing rentals in the United States, AFR Furniture Rental unveiled their latest Author the Moment campaign at TSE 2019. Occasionally, event professionals forget about the raw creative power that exists within them. It is AFR’s job to gently give these individuals a shake and remind them, along with the rest of the world, that this moment is yours. It belongs to you. You strive to elevate successful events into unforgettable experiences. You craft the perfect memory and stand behind your unique, eye-catching achievement. This is about you from the beginning. You are a creator, and innovator – an author. Author the moment with AFR. Also on display at The Special Event this year was AFR’s gorgeous new line of ottomans – the Luxe Collection. These lavish and vibrant benches and ottomans convey a fresh, sophisticated look on the cutting-edge. Available now in a variety of shapes and high fashion colors, they can be grouped together to build striking arrangements – or used as standalone pieces for remarkable and unforgettable results. Luxe is deep diamond tufted by hand and features plush, ultra-soft velvet fabric. Don’t simply make in impression at your next event. Make a statement with the Luxe Collection. 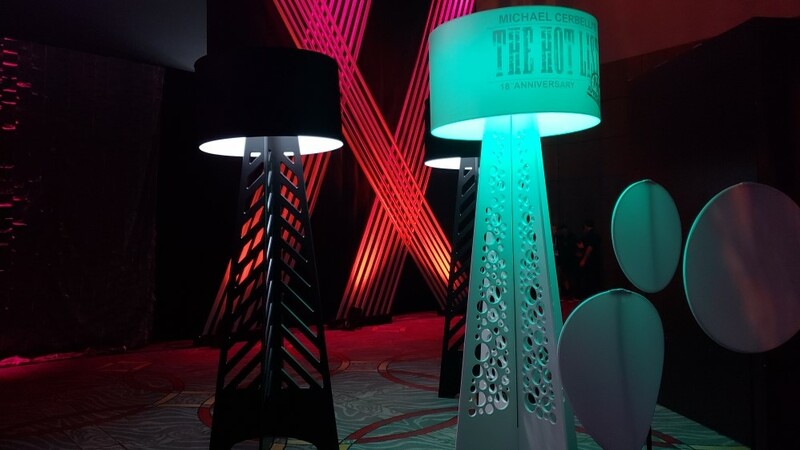 A sure sign of creativity and innovation, AFR was very proud to be featured in Michael Cerbelli’s: The Hot List™: 2019 for their all-new nine-foot-tall Mondo lamps. Brace yourself: bright just got bigger and better. 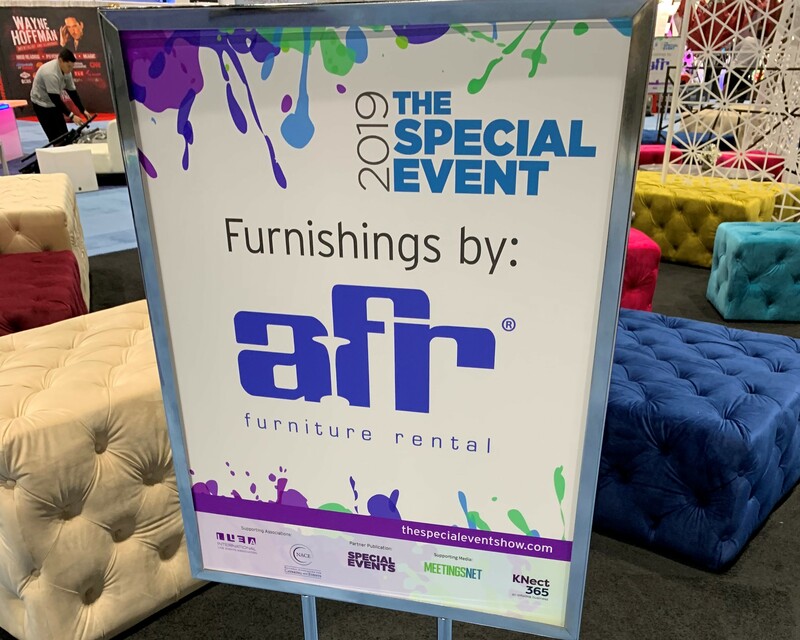 AFR Furniture Rental had the opportunity to sponsor the 2019 Attendee Lounge at TSE. They featured some of their latest and greatest product lines – including the Luxe and Mondo collections. Also on display at the lounge were a few more of AFR’s most recent additions including their new Divider Walls. These functional and decorative walls add the perfect touch to virtually any setting. They can be used vertically as a stylish backdrop for your trade show booth. Or set them horizontally to segment an area for your VIPs. These sturdy metal dividers are available in a golden black, golden sand, or gloss white and feature elegant geometric shapes. The naturally beautiful and understated Greystone Tables were also used to achieve the ideal lounge environment. Talk about setting your style in stone! Greystone features a honed marble top and burnished bronze base design. Cocktail, end, and console tables are available. 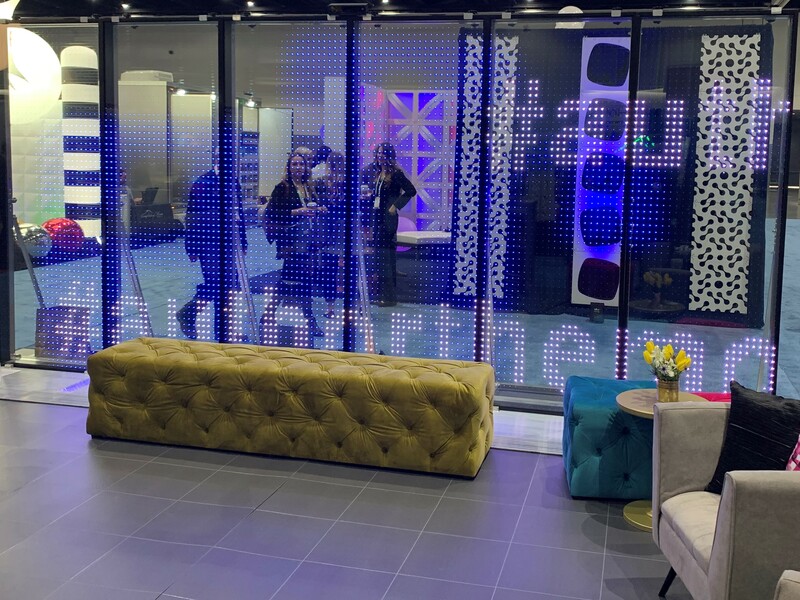 This year, AFR partnered with G-SMATT America for technology perks such as interactive features and gamification via G-Smatt’s smart glass media display. Attendees had the ability to write on the wall from a separate tablet interface, and they could even reach out and pop digital balloons. The smart glass even featured AFR’s logo along with #authorthemoment and an accompanying video. Visit www.g-smattamerica.com for more information about this groundbreaking technology. 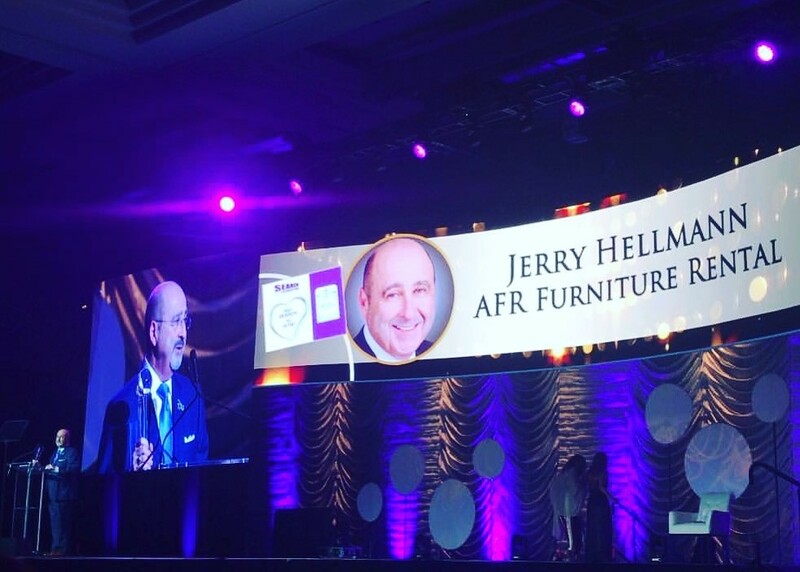 And finally – last but certainly not least – AFR co-founder and co-CEO Jerry Hellmann was awarded the 2019 Richard Carbotti Gala Award at TSE this year to commemorate his long-standing dedication to charity and giving back. Hellmann is affiliated with Abramson Senior Care, Federation Housing Inc., and the SEARCH Foundation. In addition, he is a trustee of Beth Sholom Congregation in Elkins Park, PA. Congratulations, Jerry, on this very well-deserved honor!